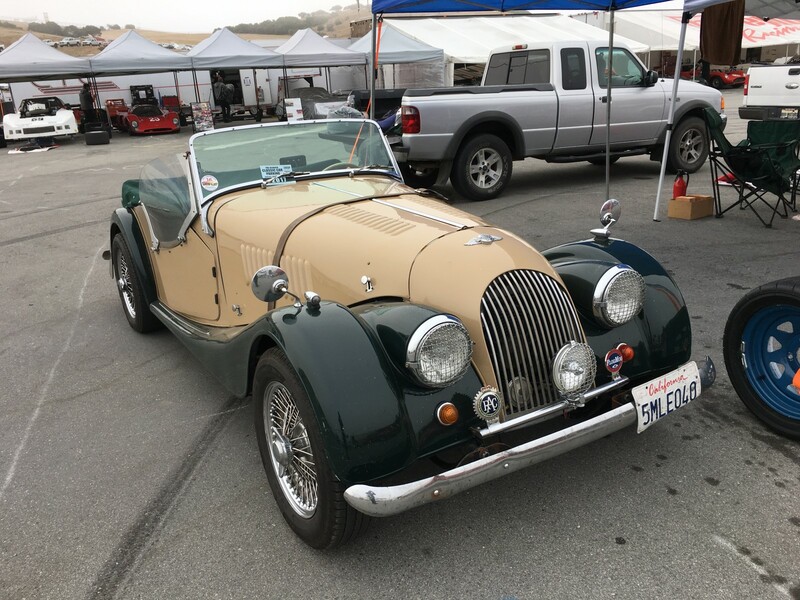 It started out foggy at Mazda Raceway Laguna Seca for Day One of the annual Pre-Reunion races. 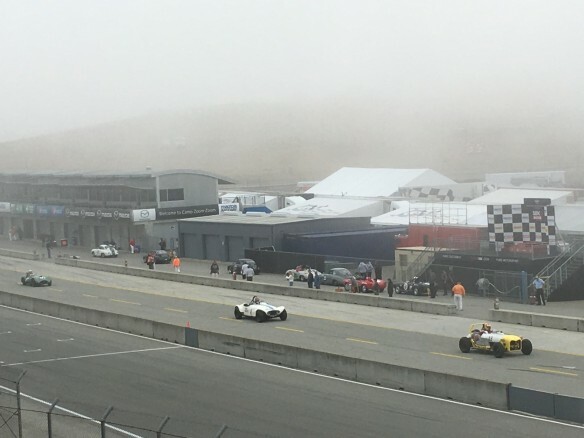 The fog-delay was short-lived and the cars took to the track only 15 minutes late. The sun came out mid-morning and remained for the rest of the day, with just the smallest of wispiest clouds dotting the skies. The weather was breezy, warm in the sun and chilly in the shade. All in all, a beautiful day for racing. The fog didn’t start rolling back in until the last race, which started after 5pm. 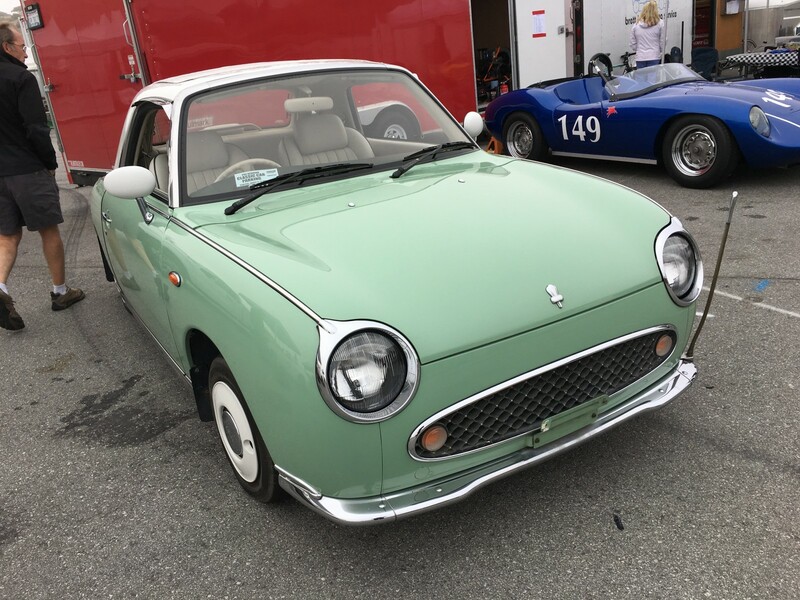 One of the nice things about vintage racing is that the paper work comes out quickly. The practice/qualifying and Saturday race results don’t show times, just positions, and race results come out right away, as there are no protests. The Sunday results will show times. The Pre-Reunion event has ten groups of cars with 309 entries, ranging from 1949 Sports Racing and GT Cars all the way up to 1991 FIA and IMSA cars. This is the run-up to the 8th Annual Rolex Monterey Motorsports Reunion, which will feature three anniversaries including the 60th for Formula Juniors, 60th for Laguna Seca as a race track, and 70th for Ferrari. Lots of history there! Mobile Museums on an iconic circuit. There was a nice turnout of anniversary Formula Juniors at Pre-Reunion, which comprise two of the ten race groups – Group Four for 1958-1960 with drum brakes and front engines, and Group Nine for 1961-1963 with disc brakes.They came from far and wide, including Australia, Denmark, England, Scotland and all over the United States, totaling 48 cars. Saturday morning was practice sessions, with races in the afternoon. It was a busy day from 8am until 5:30pm. The Pace Car/Safety Car driver got as many laps as some of the race cars. One car spun out on the Pace Lap and hit the wall in Turn Eleven. The driver wasn’t hurt, but the same couldn’t be said for the car. For this event there are two roll-back/flat bed tow trucks. All of the San Francisco Region Sports Car Club of America volunteer Emergency Crew and Course Marshal Crew worked long and hard retrieving historic cars which suffered from spins or a variety of mechanical woes. Many involved leaking fluids, and the Course Marshals put the sweeper truck to good use. More than 20 bags of oil dry/grease sweep were used Saturday. Race Six saw the Safety Car come out after the first lap for a car which didn’t negotiate the front straight. Mike Thurlow, the pole sitter in his 1976 Corvette retired in Turn Six with mechanical problems. 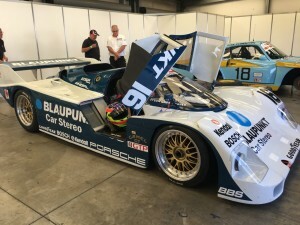 The race was ultimately won by local driver, Bruce Canepa in his 1979 Porsche 935, who gridded second. He was followed by Zak Brown of England in his blue with yellow 1981 Porsche 935, originally raced by Rolf Stommelen. Yes, that Zak Brown, now of McLaren. 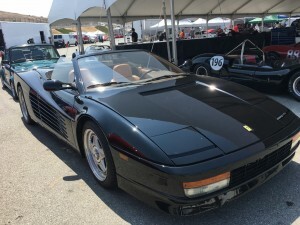 He said afterwards he always loves coming to Laguna Seca. He flies all of his team’s cars from England. They all will be back next weekend, and can be found in the small garages fronting the Pit Lane. And NO, contrary to all the Internet rumors, Brown and his F1 driver Fernando Alonso will not be skipping the Singapore F1 race to compete in the season’s finale IndyCar race at Sonoma Raceway. Brown also ran in Group Ten, starting on pole position with his No.16 1986 Porsche 962. 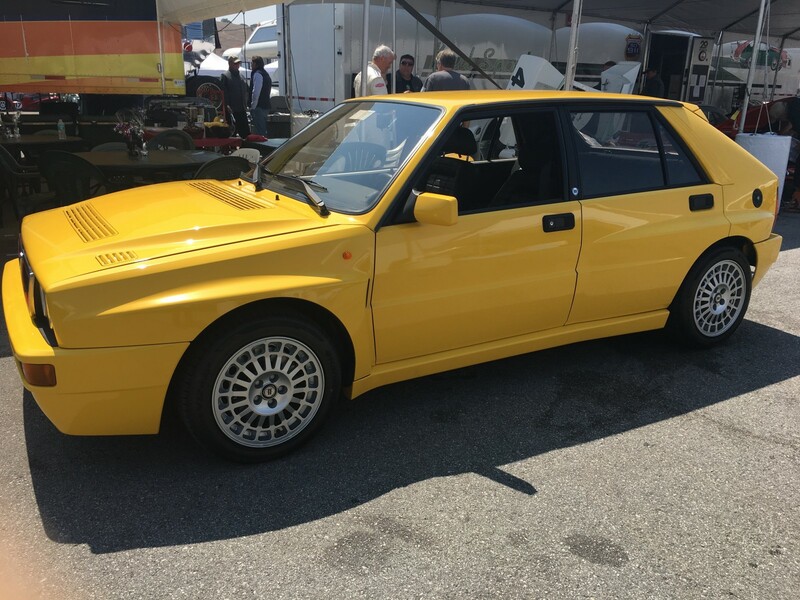 He led flag to flag in the ground-pounding field of 1981-1991 FIA and IMSA GTO & GTP cars. They were as fast as they were loud, with the Zoom-Zoom radar gun in Turn One recording a high of 141 mph. Finishing second was Bill Okerlund in his No.33 1991 Chevrolet Camaro and Kenneth Davis in No.8 1985 Roush Capri. 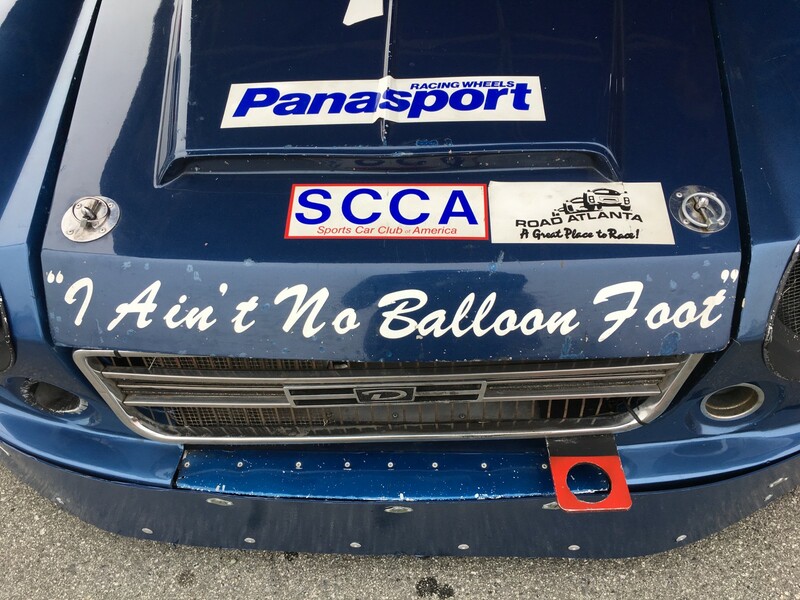 Some of the cars looked like old Trans-Am cars, including Ken Epsman’s No.53 1984 Pontiac Firebird, which had originally been raced by Bill Doyle with its famous teal and yellow Caterpillar livery, which the crew also wears. Epsman started and finished sixth. Richard Dean ran Brown’s No.46 1970 Chevron B16 in Group Eight, finishing fourth. 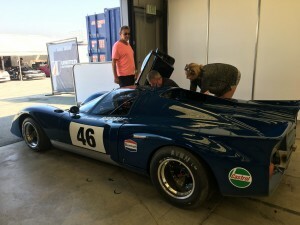 Keith Frieser from Alberta, Canada won that race in his No.27 1972 Lola T290. This group is the 1970-1984 Sports Racing Cars under 2100cc. Fellow Canadian Cal Meeker finished second in No.115 1973 Lola T294, followed by Mike Thurlow of California in No.4 1973 Lola T294. Group Nine for the later Formula Jr cars, with disc brakes, was a lively group with drivers well known in vintage circles. There were two father-son combo. 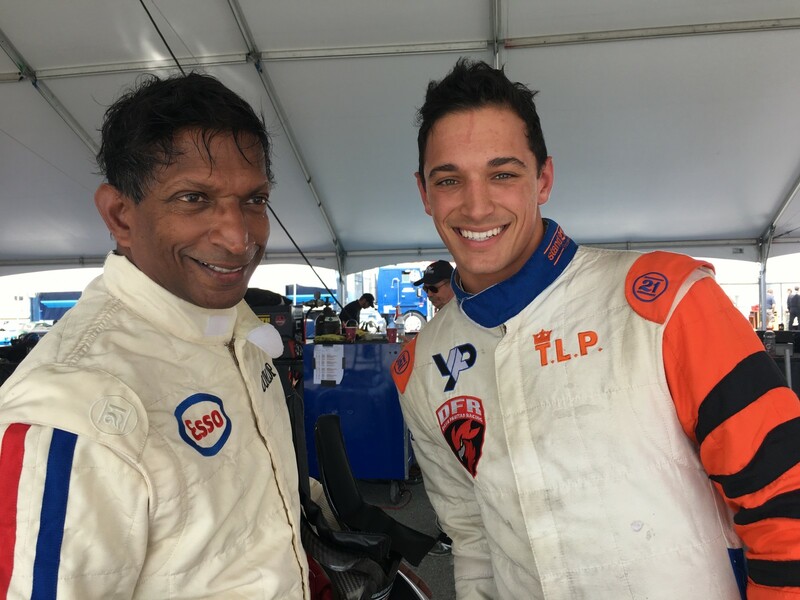 One was the de Silvas, who each also race locally at Laguna in SCCA – Timothy de Silva in No.10 1962 Gemini MkIV, who won the Formula Continental race two weeks ago and his father, Harindra de Silva in No.96 1963 Huffaker Mk3A. The other was the Bakers, Danny the son and Bob the father. 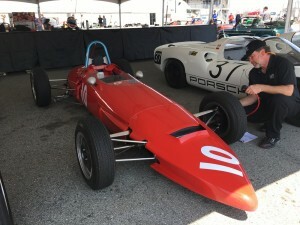 Art Hebert had the pole position in his silver No.2 1963 Lola Mk5A FJ, but he spun in the Turn Three oil dry on the first lap, and then played catchup for the rest of the race. Danny Baker, who had gridded eleventh in his No.36 1963 Lotus 27 FJ had charged to first by Lap Two. Timothy de Silva was close on his heels in second place, and eventually caught Baker and Joseph Colasacco in his No.30 1962 Stanguellini Delfino FJ. The young de Silva won, followed by Baker and Colasacco. Hebert finished ninth in a field of 31 FJs. 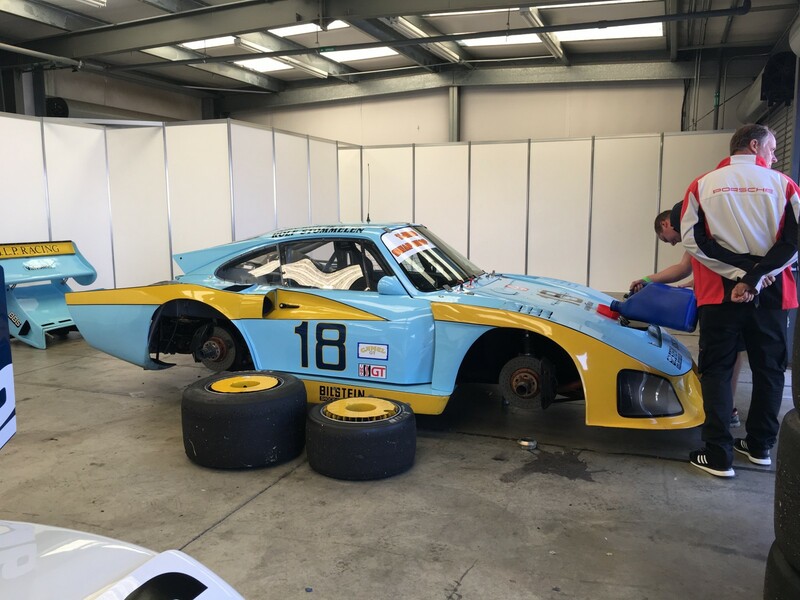 Some of the FJ drivers are also owners/drivers of historic Formula One Cars, which aren’t running this weekend. They include Dr. Nick Colyvas in his 1962 Lotus 22, finishing eighth; Chris Locke, who drove his F1 car in the movie ‘Rush’ finished eleventh Saturday in his 1963 Lotus 27; Bob Baker in his 1963 Lola Mk5A; and John Anderson in his 1961 Cooper T56. According to the Zoom-Zoom scoring on the Start-Finish Bridge, the second wave of FJ’s were faster than the leaders, clocking upwards of 114 mph going over the hill in Turn One. Sunday’s schedule calls for more morning practice, and Sunday afternoon races, with the grid set by the finishing positions in Saturday’s races. One of the highlights for me at the Reunion events is all the eye candy, and I don’t just mean the race entries.Back in 2000 Gill Campbell, now SCRAMP Senior Vice President of Event Operations, determined that the paddock was too full of generic rental cars parked with the race cars, and felt an upgrade was in keeping with the event. Special Parking Passes were issued for Classic Cars, which weren’t competing. And the idea grew. 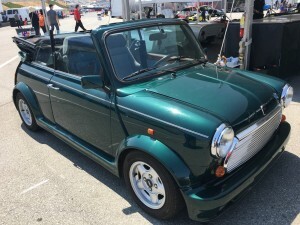 Now there aren’t many modern-era cars seen anywhere in the large sprawling paddock, but there certainly are some interesting, intriguing, unusual and flat-out gorgeous vehicles interspersed everywhere. Take a look at just a small sampling. 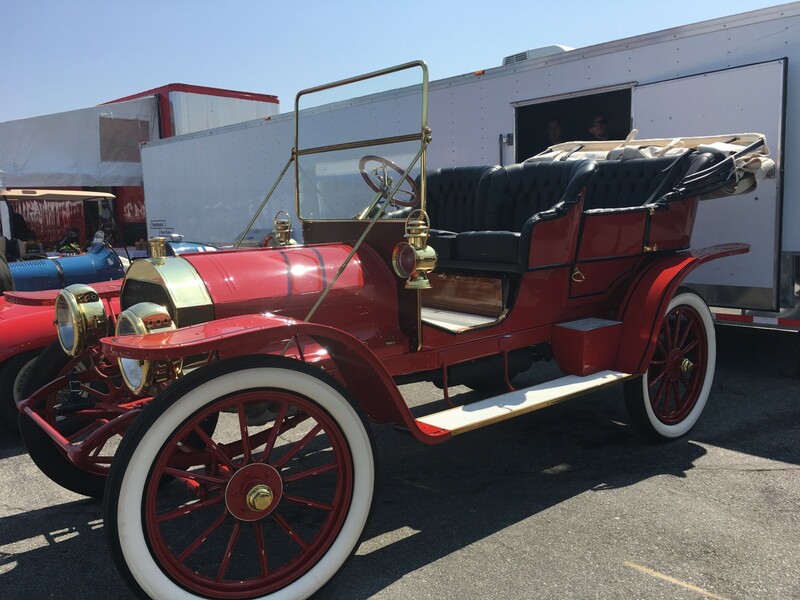 This entry was posted in Historics, Motor Sports by Lynne Huntting. Bookmark the permalink.